When you fully age pure, 100% blue agave spirit up to five times longer than you have to in ex-Bourbon casks you create… a Treasure. La Altena Distillery has been operated by the Camarena family since … well, forever. Their first distillery was destroyed during the Mexican Revolution, but they rebuilt in 1937 near the town of Arandas in the heart of Tequila country. “La Altena” does not translate directly, but it’s meaning is equivalent to “little highland lass.” Don’t you just love that? Some things are just the same across all cultures. They still do Tequila magic old school with masonry ovens and an ancient Tahona mill stone. Today, La Altena distillery is operated by grandson and master distiller Carlos Camarena and they only make the good stuff, including premium brands El Tesoro, Tapatio, and Ocho. Muchas gracias mis amigos! The “brand” El Tesoro is now owned by Beam Suntory, but the Camarenas still do the heavy lifting. By law, in order to call a Tequila “Anejo” it must be aged for at least one year in oak. If you are a fan of great Tequila, it will not surprise you that this low standard is just not enough for El Tesoro. “El Tesoro” means “the treasure” and they treat it that way. Their Anejo is a blend of their “estate” Tequilas aged three to five years in in ex-Bourbon American oak casks. All Tesoro Tequilas are 100% blue agave with nothing added and crafted in their old-school traditions stretching back more than 100 years. It’s no wonder that El Tesoro Anejo Tequila consistently wins awards and the praise of Tequila-lovers everywhere. 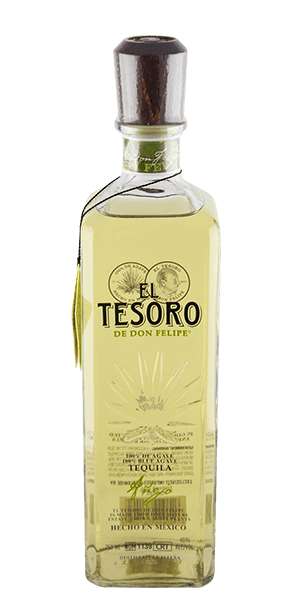 What does El Tesoro de Don Felipe Añejo Tequila taste like? The Flavor Spiral™ shows the most common flavors that you'll taste in El Tesoro de Don Felipe Añejo Tequila and gives you a chance to have a taste of it before actually tasting it. Orange zest, caramel, and rye grain in the field. Orange zest and rye again, opening up to oak, cinnamon, and pipe tobacco. Soft, herbal, and lightly sweet. A nice combination of sprite and smooth. A very smooth Anejo. Got it to share with friends and we were all impressed. This is an excellent sipping tequila. A light zesty taste & sweet finish. Very glad to have been introduced it. Excellent very smooth with a hint of smoke..